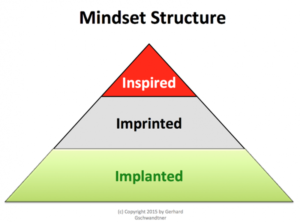 For the past two decades, my good friend and mentor Gerhard Gschwandtner (if you don’t know who he is, you’re not in sales) has been investigating the thought patterns of successful people and how to replicate them. •	What belief that I had since I was a child has proven the most useful? •	What belief that I had since I was a child has held me back the most? •	What can I do, today, to reinforce and strengthen the useful belief? •	What can I do, today, to expunge and eliminate the dysfunctional belief? •	What three books have influenced me the most? •	What three experiences have taught me the most? •	What can I do, today, to strengthen the beliefs I acquired? •	Given my current goals, who are the three best mentors (authors, experts, consultants) who can help me grow? •	If I could do anything and knew that I could not fail, it would be? •	What is holding me back from following that inspiration? •	What parts of my life are leading me toward that inspiration? •	What is my plan to transition to following that inspiration?